1. Enter child's name 2. Click on phonetic pronounciation 3. Click on each CD! Listen for the correct pronunciation--the spelling of the name (for CD label) can be edited. 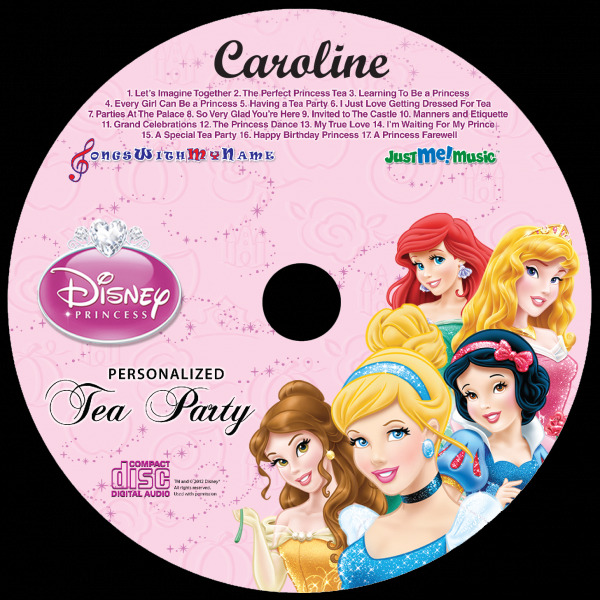 DISNEY PRINCESS TEA PARTY-- Hear the Disney Princesses sing and speak to your child over 60 times throughout this one of a kind CD. 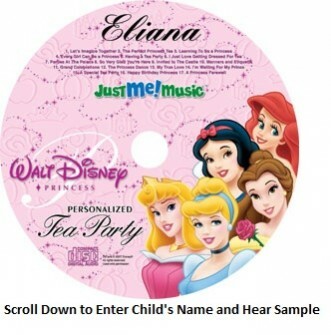 It will be an instant hit with your child that she will listen to over and over. Watch her face light up as she hears her name sung and spoken by the original Disney Princess cast. She will join each of the Disney Princesses as they prepare for a Princess Tea Party. Each princess will personally coach your child through getting dressed and using proper etiquette, and your child will receive a personal invitation to the castle to join all the Disney Princesses at their Princess Tea Party! Now with your purchase of some of our CDs, you can request a BONUS digital copy with your purchase that can be used in any digital device...ipads, ipods, smartphones, tablets, computers, and thumb drives. Just complete your order and type SEND ME DIGITALS in the order notes.